Despite previous promises to reduce the number of American forces in the Middle East by 2015, Defense Secretary Chuck Hagel announced early Saturday that more American troops, up to 10,800, are to remain in Afghanistan than previously expected. The news comes just hours after the announcement that the American hostage held by Al Qaeda forces in Yemen, Luke Sommers, was killed during a failed rescue mission. 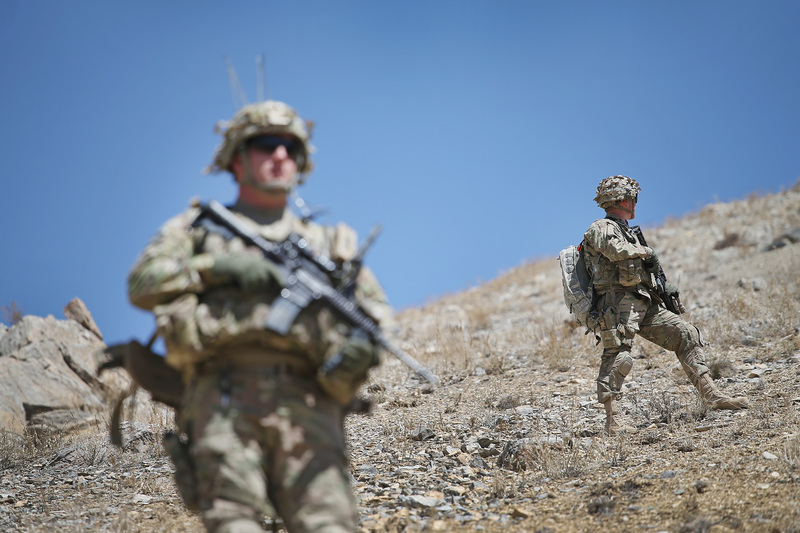 Though American officials still hope that only 5,500 troops will remain in Afghanistan by the end of next year, Hagel and other defense experts believe that there remains a distinct need for US troops in the coming months. In the last few weeks, Taliban attacks have increased, and despite promises of additional foreign aid for a NATO train-and-assist mission in Afghanistan, few countries have sent the necessary manpower to sustain such an operation. Indeed, it is because of the "late signing of the Bilateral Security Agreement," CNN reports, that has necessitated the additional troops in the country. One of the first moves Afghan President Ashraf Ghani made after assuming office was to approve the agreement, a decision that has infuriated a number of insurgent and militant forces in his country. Said Hagel, "It's predictable that they would do everything they could and continue to do to try to disrupt and discourage the new government of President Ghani." The new number of 10,800 is a solid 1,000 more troops than the 9,800 initially planned. At a joint news conference with President Ghani in Afghanistan's presidential palace, the defense secretary noted that President Obama "has provided U.S. military commanders the flexibility to manage any temporary force shortfall that we might experience for a few months as we allow for coalition troops to arrive in theater. But the president's authorization will not change our troops' missions, or the long-term timeline for our drawdown." By 2017, he said, all American forces should be consolidated to Kabul. As difficult, as challenging, as long as this has been, by any definition the country of Afghanistan, the people of Afghanistan, are far better off today than they were 13 years ago, if for no other reason than they have the opportunity to decide their own fate, their own way, on their terms. They're not completely there yet, but they've come a long way and that's to the credit certainly of the United States. Hagel, who spoke to reporters on a military aircraft en route from Washington, DC to Afghanistan, commented on the vast improvements the country has made in the decade since the war began. When Hagel made his first trip to the region in early 2002 as a Republican senator, American officials were forced to arrive at nightfall and leave before dawn to minimize security risks. Though the Taliban has regained some footholds since American troops turned its attention to Iraq in 2003, the situation, according to Hagel, seems much improved. Now, the primary goal of the remaining American forces is to strategize with Afghani forces and ensure a longterm strategy for peacekeeping in the region. Said Hagel, "I have confidence in the Afghan security forces that they will continue to meet...challenges" presented by "pockets of resurgence." Keeping troops in the region will also allow the US to carefully monitor progress and provide assistance should their help be needed. "The Afghan people and the Afghan government ...have asked us to stay," Hagel told CNN, which is why the drawback of troops from the country has been much slower than the process in Iraq. Hagel's unannounced trip to Afghanistan is his fourth since 2001 and will be his last as the defense secretary, as he announced his resignation earlier this week. He will make a number of stops during this final tour, where he will be able to assess the progress made during his tenure in the Obama administration. One of his primary tasks as the defense secretary was to reduce the number of troops in Afghanistan, and this final move seems somewhat antithetical to his and the administration's stated goals. But still, the decision comes as evidence of the United States' committment to "preventing Al-Qaeda from using Afghanistan as a safe haven."